Broken Frontier proudly announces the winners of the 12th annual BF Awards. Our 2015 awards saw a record-breaking number of votes come in from our readers, and unprecedented interest in the nominations across the medium, whether it be from the BF audience, creators, publishers or our fine colleagues on other news and comics culture sites. The shortlist this year reflected the site’s coverage over the preceding twelve months like no other before it. While Image Comics made it an impressive five wins in six years as Best Publisher this was a particularly notable year for the micropublishers with Avery Hill Publishing, Breakdown Press and Retrofit Comics making up 60% of the nominees in that category, and recognition for Youth in Decline and One Beat Zines elsewhere on the ballot. By far the most fiercely fought section, though, was that of Breakout Talent with that category gaining nearly twice as many votes as most of the other sections. 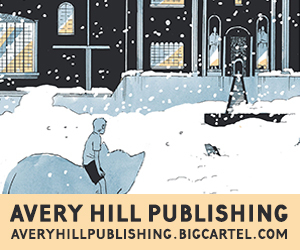 While the phenomenon that is Tillie Walden came out top in the end there is no doubt that the intense interest shown in the nominees here is entirely indicative of the bright futures ahead for Andrew Maclean, Jessica Martin, Danny Noble and Babs Tarr. It was also a pleasure to see so many creators represented who were either first featured at Broken Frontier or whose small press work we have particularly drawn your attention to. One such individual is Andy Poyiadgi, an artist we have been covering at Broken Frontier since his self-publishing days, and whose win for Best One-Shot for Lost Property goes hand-in-hand with his 2015 British Comic Awards nomination. Indeed this was a year when no single publisher dominated with winners coming from Avery Hill Publishing, Dark Horse Comics, DC, Drawn & Quarterly, Image, Jonathan Cape and Nobrow Press. A fitting tribute to the breadth and diversity of the form over the course of 2015 in a year when our nominees represented all areas of the medium – from grassroots self-publishers like Kim Clements through to Big Two super-hero comics. Scroll down for a complete overview of the winners of the Broken Frontier Awards 2015. Keep your eyes on the site this week and next for spotlight articles on each of them. Thank you once again for your most appreciated support of the 2015 BF Awards and for sharing our ballot on social media! Staff Picks for January 31, 2018 – Hungry Ghosts, The Weird World of Lagoola Gardner, Lazaretto, Godshaper and More!